As an established heating and plumbing installer, you may think you already have it all – loyal customers, a good reputation and a steady stream of referral business. But are you missing a trick? Exclusively for Installer magazine, Nigel Best, Managing Director at electrical training specialists, Electrician Courses 4U, explores why installers should think seriously about adding electrical qualifications and expertise to their skill-set, and how they can go about it. Many installers will have worked on central heating, bathroom, shower or kitchen projects where electrics are part of the job. Controls, ventilation or lighting – they’re all an intrinsic part of the jobs that we do, and the parts where we invariably need specialist outside help. But, instead of subbing out this work to an electrician, perhaps, it’s time to realise the opportunity that taking on electrical work can provide. There’s the obvious point that the more you can do yourself, the more profitable any job is likely to be. It just makes plain financial sense. But there are other advantages that make it a step worth considering. How often have you sat around on a job, waiting for the sparks to turn up, only to be told that they’re delayed elsewhere, sick or letting you and your customer down in some other way? How many times have you felt that the electrician you’re using doesn’t work quite to your level of standards? Whichever way you look at it, subbing out the electrical part of a job can bring with it a lack of quality control that can prove frustrating for you, potentially compromise your reputation and risk antagonising a good customer through no fault of your own. Beyond these short term advantages, adding electrical skills to your business will expand the services that you provide to your customers. It will allow you to cover for any business shortfall in your heating and plumbing work that you encounter and give you the chance to balance that with electrical work that you can do, sometimes for the very same customers. By offering a more complete service for the home you can make your business more resilient to the tough times and pick up more work from existing and new customers. Getting qualified is the first and most important step. As a minimum, you will need a Level 3 VRQ from the awarding bodies City & Guilds or EAL (Excellence, Achievement & Learning) to correctly and safely carry out electrical work in the home. Here, providers, like EC4U, can help. We’ve developed a tailored course, called the Domestic Electrician Package, which is specifically geared to new entrants into the market and offers the kind of hands-on training experience that’s so important if you’re to get to grips with a new skill quickly and effectively. This type of course is typically broken down into different modules which cover the vital skills and qualifications required. You’ll get knowledge and insight into how to design, combining both theoretical and practical elements, before being taken through the basic fundamentals of electrical wiring and shown how to alter different wiring circuits to a consumer unit. 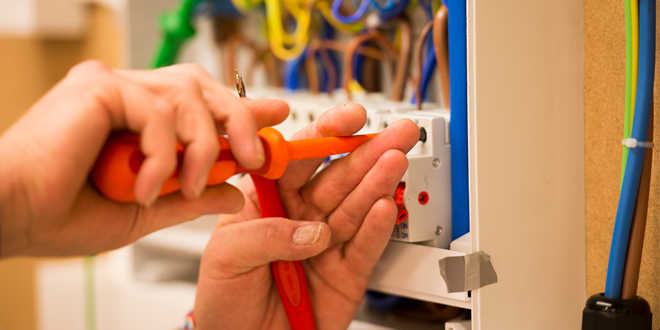 You’ll learn how to inspect and test new or changed electrical wiring circuits, how to safely carry out dead and live tests and fill in the required paperwork that will need to be left with the consumer unit. You’ll be trained in Part P of the Building Regulations (City and Guilds 2393), and find out the electrical safety do’s and don’ts you need to work in the home. You will also gain a qualification in 17th Edition Wiring Regulations, updated to the current third amendment. This section of the course will give you the knowledge in order to pass the exam, teaching you how to navigate your way through the book and understand the importance of the regulations. In the best equipped training centres, you’ll also have the chance to practice all these electrical skills in real-life scenarios. This includes fitting controls, lights, fans and much more, to become more confident and comfortable in completing these tasks as part of your everyday business. You’ll also receive practical business advice on how to quote for work and market yourself successfully to your customers. This course is perfect for installers wanting to gain the required qualifications, competency and practical skills they need in order to join a Government approved Part P scheme, which will allow you to self-certify that the electrical work you’re carrying out will meet both current building and wiring regulations. As you might expect, completing such courses is far from being an overnight process. You’ll need to commit a minimum of 20 days at our training centre to make sure you’re getting the right in-depth training you need. At EC4U, you can break the course up into shorter term modules which will allow you to take different course components at a time to suit your plumbing and heating business. It’s not just the time that you’ll need to be realistic about. This training will also cost you money. Again, though, help is at hand. Some courses, EC4U included, will allow you to split the courses up. We offer a ‘Pay as You Train’ scheme, which allows you to put a deposit down and secure your place for the first of four modules for this course. After committing to a week at a time for further modules, the balance remaining would be split into three instalments which is due 14 days before each module start date. Once the training is successfully completed, you’re in great shape to take more control of your business, your reputation and your success. The investment you make in becoming a trained electrician could be the best money you’ve ever spent. Based in Ditchling, East Sussex, EC4U are specialists in providing quality training exclusively for the electrical market. Courses are specifically aimed at those with little or no knowledge as well as those that are looking to enhance their existing skills or qualifications within the building industry. EC4U provides hands-on training in a unique Experience Centre facility, allowing attendees to try out the practical skills they have learned in authentic, real-world scenarios. More information is available at www.electriciancourses4u.co.uk.